The Darcy Widespread 2-Handle Bathroom Faucet from MOEN sets the standard for exceptional beauty and reliable, innovative design. Petal-like handles and a swan-like spout bring a soft, relaxed feeling to your sink, while the gleaming chrome finish offers a bright, mirrored appearance that reflects light. This environmentally friendly design is also WaterSense certified to reduce water waste, making it an efficient and responsible choice for your home. Brand new style meets all-around use in this beautiful piece from GLACIER BAY. Turn your bathroom into a stylish space with this dual-control faucet. Make your bathroom look like new with this item's deck mounted design. This WaterSense certified faucet saves water and money, but gives you the same clean. Across the Eurocube range, cut-out detailing on the lever handles reduces the perceived volume of each piece, while highlighting the minimalist appeal of the collection. Eurocube Lavatory Wideset offers a sharp, tailored look in the bathroom. Perfectly aligned to the design needs of today's Cosmopolitan consumers, this collection offers cutting-edge, geometric styling at an unbeatable price. Shimmering in the light, Kensington harks back to a bygone era of glamour and indulgence. Sophisticated and precious, the multi-faceted handles bring a jewel-like quality to the basin area and can be found across a range of complementary bath fittings. Luxurious and attractive, Kensington will be the talking point of your home. By combining superior technology with a choice of breath-taking designs, GROHE can provide you with all the elements to enhance your bathing space. Exposed pipes and industrial-chic finishes are just a few of the downtown loft-inspired design details that come to life in Arris faucets and accessories. Sharp angles and tubular lines dominate each piece in this modern collection. A matching suite of products is available to coordinate the look of your bath. This trim kit requires MOEN valve 9000 to complete installation. Darcy 8-Inch Widespread 2-Handle High-Arc Bathroom Faucet in Chrome The Darcy Widespread 2-Handle Bathroom Faucet from MOEN sets the standard for exceptional beauty and reliable, innovative design. Petal-like handles and a swan-like spout bring a soft, relaxed feeling to your sink, while the gleaming chrome finish offers a bright, mirrored appearance that reflects light. This environmentally friendly design is also WaterSense certified to reduce water waste, making it an efficient and responsible choice for your home. 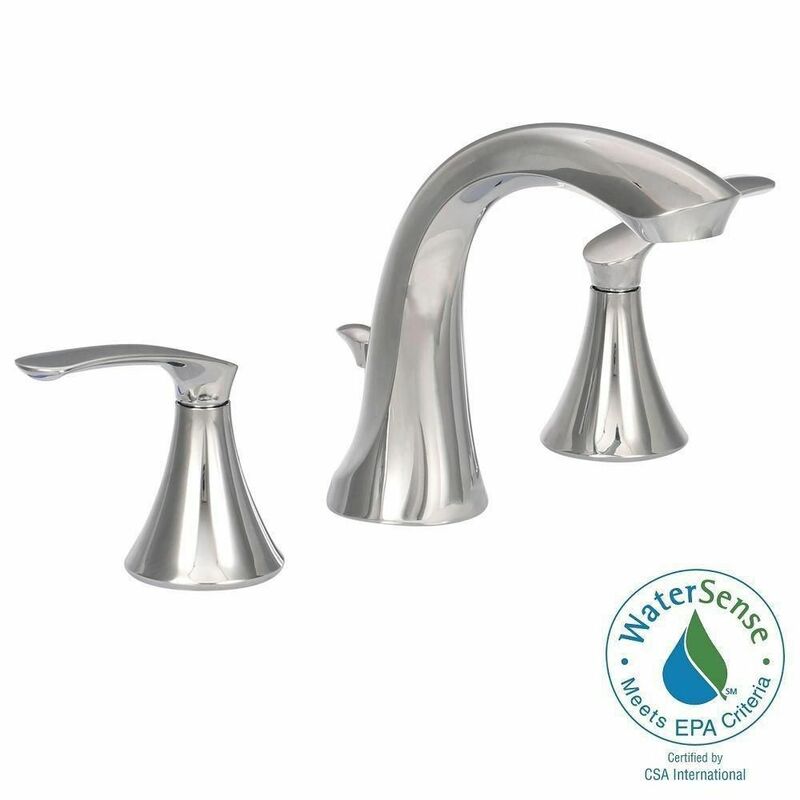 Darcy 8-Inch Widespread 2-Handle High-Arc Bathroom Faucet in Chrome is rated 4.3 out of 5 by 57. Rated 4 out of 5 by CeceR from Very nice faucet. Package included a drain which installer thought... Very nice faucet. Package included a drain which installer thought was not good quality, so we ended up purchasing a better drain, so add on another $30+ --- Looks great and very smooth operation. Rated 5 out of 5 by Gunner from I'm a huge fan of Moen products. I bought this style for my mothers bathroom remodel. It's absol... I'm a huge fan of Moen products. I bought this style for my mothers bathroom remodel. It's absolutely gorgeous! Rated 5 out of 5 by Judith from I purchased two units.Handsome. Easy to install. Functional. So... I purchased two units.Handsome. Easy to install. Functional. So far, so good.We’ll wait to see reliability and longevity. Rated 3 out of 5 by Marie from I bought this faucet on March 27, 2017. It's almost two years old. Now I have a problem with th... I bought this faucet on March 27, 2017. It's almost two years old. Now I have a problem with the cold water faucet. It doesn't turn. The plumber said it froze. So I have to buy a new complete set or have Moen replace the defective cold water faucet. Rated 5 out of 5 by FIXXY from nice looking faucet, works well, good instructions to install. ... nice looking faucet, works well, good instructions to install.